Swimming pool renovation by Exterior Worlds transforms the existing size, depth, and appearance of existing swimming pools. Pool geometry, along with its horizontal and vertical measurements, will often change drastically. New surface areas are typically added as well, including high-grade coping and tile work to spas, water jets, and new surrounding hardscape structures. This degree of overhaul not something the average pool contractor wants to mess with. There are too many control grade factors to contend with from a conceptual level alone. 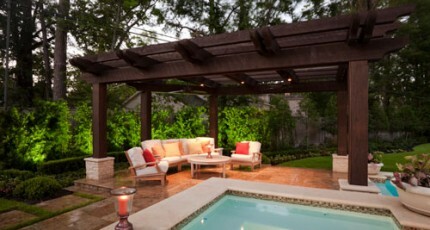 Pool contractors prefer to bring an existing design to a property and build new structures from the ground up. Our team, on the other hand, starts in the field and works from an entirely different frame of reference. We approach swimming pool renovation with the intention of creating better landscape architecture by introducing a new pool design that more appropriately compliments home architecture and provides a better aesthetic linkage to divergent landscape elements. 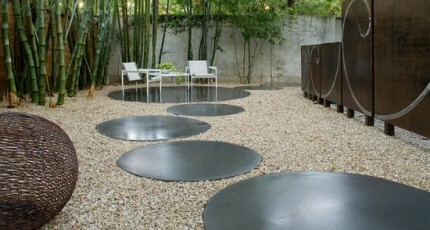 In order to accomplish this, we must begin the design-build process in the backyard itself. 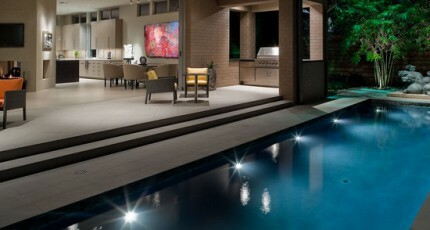 There are simply too many factors that go into swimming pool renovation to approach from a drawing board perspective. Whereas pool companies plan new structures in an office and bring these plans to the client to choose from prior to build out, we do something completely different. We examine every detail of the property, letting landscape itself speak to us in order to gain a new vision of what we are developing as one of the major focal points of outdoor living and recreation. Taking this approach ensures that any swimming pool renovation we complete be balanced and in harmony with its surroundings. Beginning the design process onsite has other advantages beyond the aesthetic. There are many challenges that face the team each step of the way. Trees, utility lines, existing hardscapes, foundations, and drainage systems all have to be worked around during in a major landscape design-build such as this. Tree preservation is very important aspect of our work that we take pride in performing. Root systems grow deep underground and fan out in every direction from tree trunks. We simply cannot start digging out the far end of a pool without first making certain that no major root systems are present in that location. If they are, we have to either expand the pool in a new direction, or develop a means of changing its shape and size without harming the tree. Drainage systems and utility lines must also be respected. 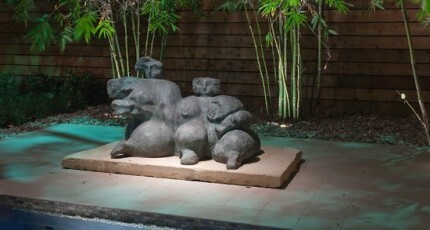 There is almost always something buried in a yard that professionals have to work around. The city of Houston does not appreciate it when you cut their gas and power lines—and homeowners do not like it either when they power or gas in your home as the result of clumsy swimming pool renovation techniques. Many different approaches can be taken here to protect buried utilities and tree roots, but these steps must be taken in a very calculated and measured way and never impulsively chosen and rushed. Hurried jobs by busy pool companies almost always result in some kind of damages that cost the homeowner additional and very painful expenses. Perhaps our greatest strength as a pool renovation contractor is our ability to make course corrections to our plan of design whenever we encounter such obstacles in the field. Because we ourselves install such elements as drain systems and trees of all species and sizes, we are familiar with ways of working around what other specialists may perceive to be insurmountable barriers. 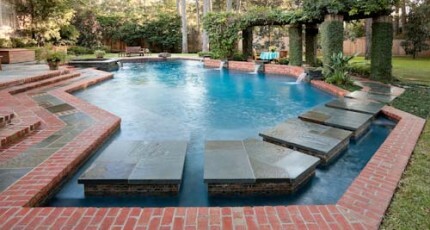 A solid knowledge of hardscape design also helps us to devise innovative methods of changing pool elevation and grade. Sometimes raising a patio or coping may allow us to make the pool deeper without having the lower the shell to a depth that is either impractical or unsafe. 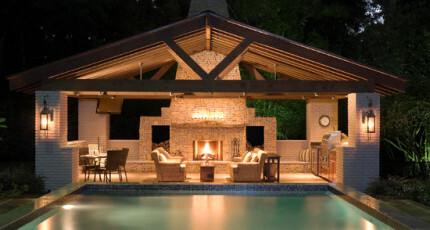 What Makes Pool House Designs by Exterior Worlds so Unique?